id A unique ID to use for each window. This is the ID you'll use to interface to it. screenRect Rectangle on the screen to use for the window. The layouting system will attempt to fit the window inside it - if that cannot be done, it will adjust the rectangle to fit. 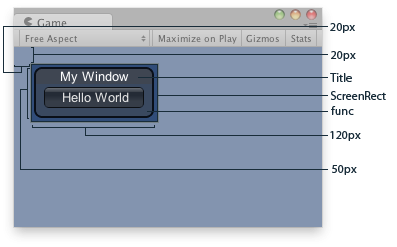 func The function that creates the GUI inside the window. This function must take one parameter - the id of the window it's currently making GUI for. text Text to display as a title for the window. image Texture to display an image in the titlebar. content Text, image and tooltip for this window. style An optional style to use for the window. If left out, the window style from the current GUISkin is used. options An optional list of layout options that specify extra layouting properties. Any values passed in here will override settings defined by the style or the screenRect you pass in. Rect The rectangle the window is at. This can be in a different position and have a different size than the one you passed in. Make a popup window that layouts its contents automatically. Window in the Game View. // make the window 100 pixels wide no matter what.